iMaint is a versatile CMMS that is suitable for a wide variety of industries and organizations. Whatever the size of your commercial establishment, you can utilize this software to improve your maintenance processes. On top of that, it can scale as your business grows so you can keep your current investment. This is also beneficial if you wish to implement this in one location first and roll out to other branches after a successful trial. Additionally, you can choose to deploy iMaint on-premise or in the cloud. This allows you to customize the solution to your requirements and to control your software budget. However, whichever option you choose, you can count on the solution to provide utmost configurability so you can tailor it to your needs fully. With iMaint, you can expect top-notch customer service. Not only does DPSI offer personalized assistance, but the company also goes out of its way to consider customer feedback in upgrading the software. Whenever you receive updates, you can be assured that some of them were designed with your advice in mind. iMaint is designed for the use of entities in different industries. That is why regardless of whether you are in manufacturing, in food and beverage, or even in the government, you can maximize the capabilities of this software. You can also count on the solution to provide you with the improvement in maintenance operations that you need, no matter how small or large your organization is. As your business grows, you also need an application that can scale with you. iMaint provides a solution to your scaling needs, as it can expand from a single location to multiple sites when you are ready. This is beneficial to large businesses that want to start small, too. You can implement the software to one or two branches and deploy it to your other locations once you are satisfied with your trial. iMaint is available for deployment to the cloud or on-premise. For the latter, you only have to pay a one-time fee and it will be installed in your preferred equipment. This already lets you accommodate unlimited sites and unlimited users so you can scale easily. If you prefer to deploy iMaint in a cloud server, you can choose between two licensing plans. Either one lets you scale whenever you are ready, as you can simply upgrade from the lesser package to the next. This also proffers you with greater control over your software expenses, as you can accommodate only a few users as you need. iMaint is a software that prides itself in being elastic. This means that you can configure the settings and the interface to suit your organization’s needs. You can even rename the labels based on your company’s role in the industry and its various maintenance processes. The solution makes it easy for you to navigate it, too. It has navigation trees and forms that you can customize for access permissions to protect the integrity of your data and to abstract the possibility of misconfigurations. With iMaint, you can expect top-notch customer service as they deliver assistance with a personal touch. Because they understand your needs exactly, they can offer robust support and lead you toward success through the software. Moreover, iMaint takes into consideration your feedback when building product updates. That is why you can look forward to new features based on your and other customers’ suggestions. What Problems Will iMaint Solve? Unplanned downtimes are costly not just in the labor required to resolve them but also in the revenue losses you might incur. With iMaint, you can better plan preventive maintenance for each equipment. The solution can also help you keep information related to your assets such as the date of purchase, the repairs performed on them, warranty information, etc. When you have this data on hand, you can make decisions regarding repairs and part changes quickly. This way, you can reduce downtime. Managing your facilities from different systems or through paper processing can slow down maintenance tasks. iMaint gives you the ability to streamline the data for your assets in a centralized system, which makes it easy to determine which equipment requires maintenance or repair. This consolidation of management also lets you view maintenance-related costs and utilize budget analysis tools so you can break down your expenses. More than that, this aids you in planning and improving your maintenance. Maintenance personnel are always on the move and require top-of-the-minute information regarding equipment and spare parts. iMaint makes it possible for them to access real-time information so they can complete work orders, create work requests as new issues arise, adjust inventory, and perform other tasks impeccably. There are popular and widely used applications in each software category. But are they automatically the best fit for your enterprise’s special wants? A trendy software application may have thousands of users, but does it offer what you need? For this reason, do not blindly spend on popular systems. Read at least a few iMaint reviews and consider the factors that you want in the software such as the cost, main tools, available integrations etc. Then, shortlist a few apps that fit your wants. Try out the free trials of these products, read online opinions, get information from the seller, and do your investigation systematically. This profound homework is sure to help you choose the most excellent software solution for your organization’s specific wants. How Much Does iMaint Cost? 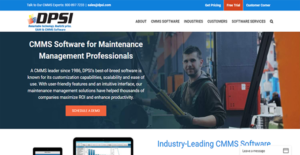 iMaint is a maintenance operations management software. It has three enterprise pricing options that are tailored to different sized business. The inclusions of these plans are outlined below to help you decide which is the best for your company. We realize that when you make a decision to buy Maintenance Management Software - CMMS it’s important not only to see how experts evaluate it in their reviews, but also to find out if the real people and companies that buy it are actually satisfied with the product. That’s why we’ve created our behavior-based Customer Satisfaction Algorithm™ that gathers customer reviews, comments and iMaint reviews across a wide range of social media sites. The data is then presented in an easy to digest form showing how many people had positive and negative experience with iMaint. With that information at hand you should be equipped to make an informed buying decision that you won’t regret. What are iMaint pricing details? What integrations are available for iMaint? If you need more information about iMaint or you simply have a question let us know what you need and we’ll forward your request directly to the vendor.